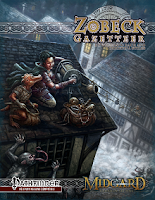 Zobeck Gazetteer has contemporary focus for a city sourcebook with the sweeping scope of early-era Forgotten Realms and Greyhawk (in a good way) sourcebooks. Thumbnail sketches contrast glittering wealth with the gritty underbelly of the city and the horrors of the Kobold Ghetto. With things to buy, enemies to defy and plenty more to see and do besides, the Free City is a jumpstart for many adventures. There's plenty of life in the city, something just about for everyone. Contents: 5 gears (an abundance of stuff). Chapter 1 deals with history. From the rule of the fey to the fall of House Stross and the rise of the Free City with hints of relations with Zobeck's neighbours. Chapter 2 takes you on a whistlestop tour from the Cartways to Upper Zobeck. It then introduces typical life among humans, dwarves, gearforged (clockwork people) and kobolds who live here. Trade with the Ironcrags, Magdar, Morgau & Doresh, sinister shadow fey and flying cities as well as river barges are detailed. Festivals like the River Fair, Winter Festival of Khors Holiday and the kobolds' We No Work Day provide seasonal markers and encounter vignettes. Details on nobility, civic officers, gangs, guilds and orders as well as crime & punishment show the distinct flavour of Zobeck. The chapter rounds off with Zobeck's neighbours - a mix of threat and opportunity. Chapter 3 zooms in on the Kobold Ghetto, where the ghetto improves the lives of many kobolds. Traps, personalities (among them many lesser kings engaged in a razored dance of intrigues and assassinations) and locations from The Dock and Ferry to The Royal Workshops and Cartways. Minor magic items at reasonable rates, markets for smugglers, exquisite clockworks and much more keeps discerning adventurers coming back. Chapter 4 considers the districts of the city, including price lists for rental and ownership of property, locations, typical expenses and adventure hooks for each district. Among the locations are numerous taverns and temples to the city's gods as well as businesses dealing in essentials. The inclusion of a city map showing the districts helps orient a GM. Details on places in the immediate vicinity of Zobeck let a GM take things outside for a change of pace. Chapter 5 looks at the street gangs, guilds and courtly societies. From the corruption of the Cloven Nine and the Mouse Kingdom's intrigues to the courtesans and salons frequented by nobles and the Shadow fey ambassador, there are plenty of affiliations, rivals and enemies to be found. This compliments the materials found in Streets of Zobeck and Alleys of Zobeck. Chapter 6 considers the religions, cults and religious mysteries of the city. As well as the legal religions, there are forbidden cults like the Red Goddess. The possibility of pacts with shadow fey and devils are discussed. One of the standout bits is the section on crab diviners and their rituals. A collection of holy relics rounds off this section and gives a strong taste of the city. Chapter 7 contains a number of NPCs, key players in the intrigues of the city. A colourful bunch of NPCs for a GM to introduce, focused mainly on the gangs and street-level, though some leaders are present (the current Mouse King, Myzi I and Mama Rye). Some appear in Streets of Zobeck and Alleys of Zobeck or previewed on the KQ blog. Chapter 8 contains assorted magics; spells for both Pathfinder and Advanced Player's Guide base classes and two new schools of magic. Clockwork magics relate to constructs and transformations of the body into a machine. Illumination magic is related to astrology and shadow, drawing equally on star and shadow. A nice touch is the animated constructs table referring to other 3rd-party books like Green Ronin's Advanced Bestiary and Frog God Games' Tome of Horrors 1. Pat Loboyko's cover is understated, yet makes effective use of colour. The rooftop hauling of loot shows the ingenuity of Zobeck rogues. Colour is sparingly used, providing contrast to quality monochrome art from Jonathan Roberts, Corey Trego-Erdner, Rick Hershey and others. Layout is logical and orderly with easy-to-read statblocks and sidebars. The cartography provides a crow's-eye view of the districts and city walls and of the Kobold Ghetto. In conclusion, Zobeck Gazetteer shows how to do a city right, offering an alternative to typical Middle Ages Europe generica even though some of it's inspirations are European. The Teutonic and Slavic roots of Zobeck show there is more to Europe than Vikings, Charlemagne and Rome. It will be a very specific game that can't find something of value here and as a springboard for adventures elsewhere, the Free City of Zobeck has much to recommend it.